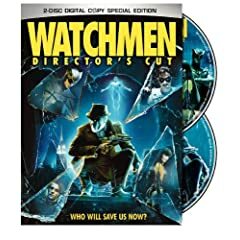 The Watchmen movie is going to be out on DVD in a couple of weeks. I haven’t seen the movie yet, but I read the graphic novel right before the last RMAF, and the Rorschach character’s way of speaking, his short, clipped way of speaking sentences…. his ‘voice’… was used as the voice for the RMAF 2008 show report. The movie appears to be popular, so hopefully more people will ‘get it’ if and when they read the show report again. Maybe next time I’ll wait until AFTER the movie comes out? So, what is with DVDs now costing $35 (discounted to $20)? Have the music industry moguls taken over the DVD industry now? Anticipate popularity of downloading free movies from internet to grow exponentially. Rinse and repeat. I talked to an audiophile who is just starting out – though he seems to be a very quick study, and knows a lot of the ins and outs already. I’m afraid I wasn’t much use to him, asking him questions instead of imparting advice [not that I ever impart advice, I am more comfortable guiding people and letting them hear for themselves and discover their own preferences, not mine]. I think he enjoyed his time there, but it didn’t really bring him closer to finding which speakers he wants to get [and me asking him 20 questions didn’t help much either :-)]. Perhaps there needs to be a printed guide, dividing up the rooms into price categories… but then show goers would miss out on hearing more expensive systems that might help them refine their preferences, and less expensive systems with stellar performance. And maybe the show needs to conduct guided tours – not of any price category, but floor-by-floor say, giving people an independent perspective on what they are seeing and hearing. More and more dealers? More and more products? In the high-end audio market? In this economy? Assume I am missing nothing and that the barrier to entry is just so low, we get lots of new people every year trying to make a go of it. Personally, I would recommend going into real estate if you got so much extra cash. Opportunities like this only come once every twenty years or more. THEN, go into audio, later, with your millions to throw away. Anyway, after almost 7 years in this business, I think we are finally where people no longer think of us a newbies. Which just goes to show that established dealers and manufacturers do get to claim the high ground with respect to audiophiles shopping around for something to buy, someone to ask questions of. someone they respect – and it is a tough row to hoe to get from Newbie to Established. But it can be fun – if not taken too seriously. And if one does not get turned off too much by knowing the ugly details of the thing you have loved from the outside. I will say that the scoundrels are few and far inbetween, and that people are almost always very nice people, and, curiously, it is their very idiosyncrasies that probably got them into high-end audio in the first place that keeps most of them from really succeeding in the market place.